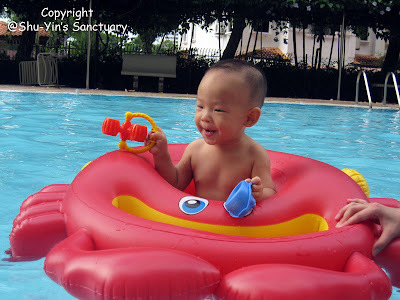 Since having his Chicken Pox in the middle of July, we did not bring Shern down to the pool at all. I knew he missed his swimming fun but right after that, hubby and I went for our East Malaysia part-business trip and did not have the time to bring him to the pool. When we came back, I brought him down swimming and boy, he must have missed swimming so much that he was all smiles at the pool! 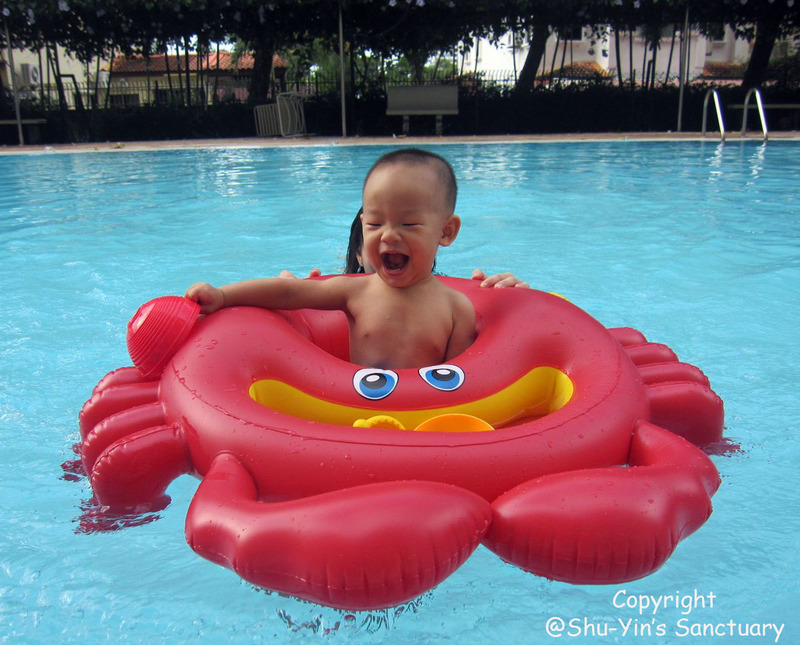 Shern really had fun splashing about and playing with his toys. Usually we would just spend 20 minutes or so each session. But he was so happy that I hadn't the heart to stop him. 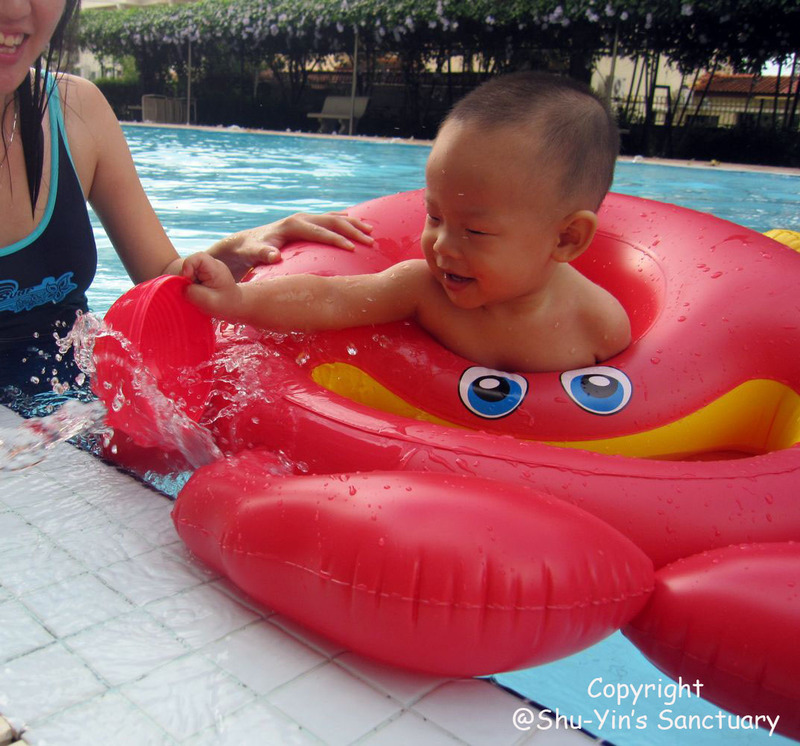 We ended up staying in the pool for half an hour 'til Shern's fingers were all wrinkled! He looks so cheeky on the left photo huh? And on the right photo, kong-kong was calling out to him from the above the apartment and Shern was there waving away and looking so happy. 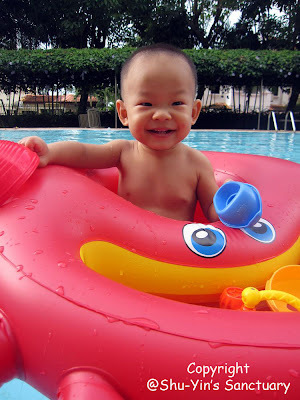 I was surprised that Shern did not even make a fuss when I at last brought him out from the pool. He was still smiling away all wrapped up in his towel. My son really loves playing in the water! My boy loves the water too and recently spends 20-30 minutes scooping & pouring water during baths, then SCREAMS when I coax him out. sometimes shern screams too when i tried to scoop him out of the pool.